An ever-growing body of critical literature, beginning nearly forty years ago with Alec Wilder’s seminal American Popular Song, has established the lasting cultural value of the classic songs of George Gershwin, Jerome Kern, Irving Berlin, Richard Rodgers, and the other great songwriters of what is sometimes called popular music’s “golden era.” (Whether or not one considers that era to have been “golden” has much to do with one’s opinion of rock and roll.) At the beginning of those decades—the 1920s through the 1950s—popular music was dominated by the sheet music publishing industry, centered on a few blocks of West 26th Street in New York City, an area that gave the business its nickname, Tin Pan Alley. But the era also saw the rise of radio and the growth of the recording and movie industries, mass media that eventually eclipsed sheet music as means of disseminating popular songs. The majority of hit songs throughout this period—and in contrast to later phases of popular music history—made their debut in Broadway and Hollywood musicals. Indeed, the history of the popular song in those years is inseparable from the history of the musical comedy. Music lovers and historians have long noted the prominent position in the sphere of popular song and musical comedy held by Jewish musicians and entrepreneurs, whether composers, lyricists, performers, producers, publishers, or movie moguls. Many of those figures were the children of Eastern European immigrants, a few were descended from an older generation of German Jews who had come to America earlier in the nineteenth century, and a small but significant number of individuals, perhaps most notably Irving Berlin, were immigrants themselves. Consequently, it seems reasonable to look to those classic songs for expressions of the Jewish American experience. 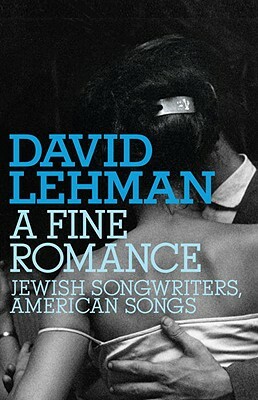 That is precisely what David Lehman sets out to do in his entertaining book A Fine Romance: Jewish Songwriters, American Songs. 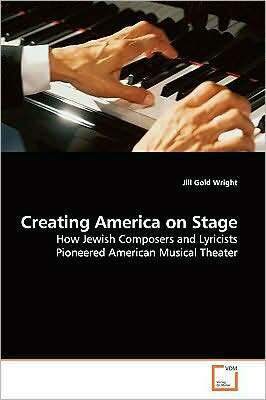 Jill Gold Wright, in contrast, devotes her Creating America on Stage: How Jewish Composers and Lyricists Pioneered American Musica Theater to a consideration of musicals as theatrical works that express a Jewish American sensibility not only in their songs but also in their plots, characterizations, and mises-en-scène. A prolific poet, David Lehman is also the editor of several notable anthologies of American poetry. Thus it comes as no surprise that his book on Jewish songwriters focuses primarily on lyrics and only secondarily on the musical features of classic popular songs. Virtually all he has to say about the Jewish character of the melodies and harmonies of those songs is to be found on the first page of his “Prelude: Jewish Genius”: “the minor key, bent notes, altered chords, a melancholy edge” (3). All of these aspects are evoked now and again in the following pages, but none is probed more deeply. For that sort of treatment, a curious reader would do better consulting Jack Gottlieb’s Funny, It Doesn’t Sound Jewish, which, despite its breezy title and a tendency to push its arguments to the breaking point, is the only book to date that attempts a sustained analysis of what sounds Jewish about the classic popular songs. Like Philip Furia, Lehman engages more fully with the lyrics and lyricists of the golden era than with the tunes and their composers. Ira Gershwin is a more vivid presence than George, Ted Koehler more than Harold Arlen, Dorothy Fields and Oscar Hammerstein II more than Jerome Kern and Richard Rodgers. Unlike the more analytical Furia, however, Lehman addresses an under-recognized aspect of the songs’ emotive power: their tendency to interact with the listener’s own life experiences and thus take on personal meanings unique to each music lover. Everyone is familiar with this “our song” phenomenon; Lehman’s insight is that it is not merely a by-product but an intrinsic part of the lyricists’ language, a finely calibrated mixture of the universal and the specific. Whereas any number of writers has commented on the classic popular songs’ malleability in the hands of performers, Lehman contributes an appreciation of their malleability in the minds and memories of listeners. Lehman conveys this insight by means of a literary device that unfortunately causes some confusion. In a prefatory “Apologia” he confesses that A Fine Romance, like The Adventures of Huckleberry Finn, is “mostly a true book, with some stretchers” (2). The stretchers are all autobiographical; in other words, the reader is encouraged to accept the parts of the book concerning songwriters as nonfiction and the parts concerning the author and his family and friends as embellished memoir or out-and-out fiction. The problem arises when the author refers to his interviews or other personal contacts with songwriters. I got well into the book before realizing that all of these interviews were imaginary. Confusing though it may be, though, the mixture of fiction and nonfiction dramatizes Lehman’s central thesis—namely, that each of us creates our own nexus of meanings in the songs we love. Unfortunately, every point Wright wishes to make about these musicals has been made previously, and more effectively, in other books, most notably in Andrea Most’s similarly titled Making Americans: Jews and the Broadway Musical, Raymond Knapp’s The American Musical and the Formation of National Identity, and even Jeffrey Melnick’s flawed but thought-provoking A Right to Sing the Blues. Wright cites none of these books, published between 1999 and 2005, nor Mark Slobin’s 1982 Tenement Songs, which outlines many of the characteristics of Jewish immigrant songs central to Wright’s argument. Readers interested in questions of Jewish immigration, assimilation, and national identity as manifested in the classic Broadway musicals and their songs would be better served to consult these earlier works. Alec Wilder, American Popular Song: The Great Innovators, 1900–1950, ed. James T. Maher (New York: Oxford University Press, 1972). Jack Gottlieb, Funny, It Doesn’t Sound Jewish: How Yiddish Songs and Synagogue Melodies Influenced Tin Pan Alley, Broadway, and Hollywood (Albany, N.Y.: State University of New York/Library of Congress, 2004). Philip Furia, The Poets of Tin Pan Alley: A History of America’s Great Lyricists (New York: Oxford University Press, 1990). Andrea Most, Making Americans: Jews and the Broadway Musical (Cambridge, Mass. : Harvard University Press, 2004); Raymond Knapp, The American Musical and the Formation of National Identity (Princeton, N.J.: Princeton University Press, 2005); Jeffrey Melnick, A Right to Sing the Blues: African Americans, Jews, and American Popular Song (Cambridge, Mass. : Harvard University Press, 1999). Mark Slobin, Tenement Songs: The Popular Music of the Jewish Immigrants (Urbana: University of Illinois Press, 1982). I thank Mr. Hamberlin for his review of both Mr. Lehman’s book and my own; he makes some important points. However, since there is a difference between criticism and inaccuracy, there is one point to clarify. In Mr. Hamberlin’s final critique that “every point” I make in my book had been “made previously,” Mr. Hamberlin overlooks an important step in the book’s genesis. Creating America on Stage, the very same book he read, was published first as a doctoral dissertation in 2003. Published by ProQuest, it was available in libraries nationwide, as well as electronically, for SIX years until it was published by VDM in 2009. Furthermore, after presenting the material of the introduction at conferences, it was published as an on-line article in 2005, and then in a compilation of essays in 2006. My book predates Gottlieb’s, Most’s and Lehman’s books. This is not to take away from any of these authors’ fine works. It is, however, a dispute to Mr. Hamberlin’s assertion that my work is imitative. Perhaps, much like the early musicals I discuss, my book deserves a second look. There is more substance there than what first meets the eye.